LAKE BUENA VISTA, Fla.—The AAU International Collegiate Baseball Team has announced team awards for the 2018 season. Voting was done a 3-2-1 scale by the coaching staff. Isaac Lewis (Babson College, MA | St. Lawrence University, NY) was named the Player of the Year. Lewis hit a team high .460/.509/.580 with 4 2B, 1 3B, 21 R, 16 RBI. In addition, he was 1-0 on the mound with a 3.27 ERA, 11.5 K/9, .818 WHIP, and 1.40 FIP. Daniel Keating (Wellington HS, FL) was named the Top Gun/Pitcher of the Year. He was 2-0 on the mound, posting a 3.08 ERA, 1.37 WHIP, 9.3 K/9, and 3.2 FIP. Jimmie Gentry (Albright College, PA) was chosen the Offensive MVP. He batted .434/.475/.623 with seven doubles (new team single-season record) and one home run. He scored 23 runs and stole five bases. Gentry and Lewis each had 23 hits, sharing a new team single-season record. CJ Cummings (University of Mary Washington, VA) was voted Defensive MVP. Cummings, who saw duty as catcher, first base, third base, DH, and pitcher, led the team in nearly all defensive dimensions, notably a 1.000 FPCT and 3.62 Defensive Range Factor. Middlesex County College (NJ) commit Ryan Cunningham (Old Bridge HS, NJ) was named Rookie of the Year. In eight innings pitched, he had a 4.50 ERA, 1.38 WHIP, 9.7 K/9, and 2.41 FIP. At the plate, he hit .310/.375/.379. Brent Jones (New Jersey Institute of Technology) was the recipient of both the Teammate of the Year and Outstanding Leadership Awards. In 9.1 innings, he registered a 5.78 ERA, 1.39 WHIP, 10.6 K/9, and 4.41 FIP. Connor Graham (Central Penn College, PA | Anne Arundel CC, MD) was voted Outstanding Sportsmanship honors. He hit .380/.439/.480 with a triple and home run, 22 runs scored, and established new team single-season records with 20 RBIs and total runs produced (41). 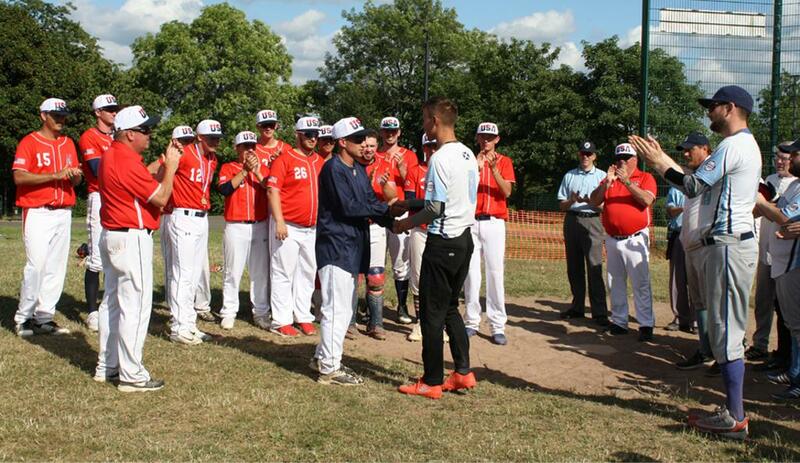 Joe Schipsi (Cabrini University, PA) was selected for the Falcon Award recognizing character, spirit, and enthusiasm for AAU international collegiate baseball. Conor Cochran was voted the Most Improved Player. After a slow start, he finished strong, hitting .294/.444/.471 with 4 2B, 1 3B, 7 R, 14 RBI. Drew Ventrelle (University of Chicago, IL) was the recipient of the True Grit Award as the athlete who best demonstrated the qualities of courage, determination and perseverance and what people can do went they want something bad enough. Ventrelle played the hot corner and led the team in runs scored (26), sacrifices (4), tied for walks lead (11), and reached base a remarkable record 14 times on errors. The following players were selected All-Stars by opponents: Cummings, Gentry, Graham, Jones, Lewis, Mac McGrath, Zach Renner, Schipsi, James Sofield, and Ventrelle.